Since June 11 the workers of ERT, Greece’s only public broadcaster, have been occupying the building in defiance of the government. Every desk in the newsroom is taken. The long, fluorescent-lit room is buzzing with the audio from the wall of television screens monitoring different news networks and from journalists shouting in Greek, taking phone calls, preparing scripts and monitoring online feeds. A light cloud of nicotine and tobacco hangs over the place; almost everyone is a chain smoker, and no one can be bothered with going outside anymore. “It’s just one more rule we have to break,” we were told. They were only half-joking. Looking around the headquarters of the Hellenic Broadcasting Corporation (more commonly known as ERT), one would never guess that the corporation was technically defunct, all the staff unpaid volunteers. Yet since June 11 the workers of ERT — journalists, technicians, musicians, and the administrative and cleaning staff — have been occupying the building in defiance of the government. Labelling Greece’s only public broadcaster a “haven of waste” in the midst of an economic crisis, the government gave only about six hours’ notice before ERT was taken off-air. 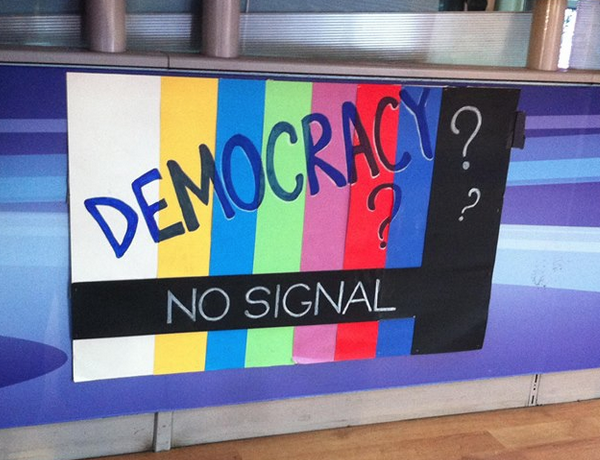 Television transmissions cut to black, leaving a “no signal” warning on screens. Satellite channels and radio stations also ceased broadcast. There had been no debate in Greek parliament. Out of the three parties in the coalition government — New Democracy, PASOK and Democratic Left — only one supposedly had any idea of what was to come. Both PASOK and Democratic Left claimed that although they supported the idea of restructuring ERT, they had not known it would be so suddenly shut down by decree from Prime Minister Antonis Samaras. Refusing to accept such an undemocratic move, the staff of ERT chose to stay within the building and keep working. They continue to produce content, providing it via an online livestream with support from the European Broadcasting Union (EBU). 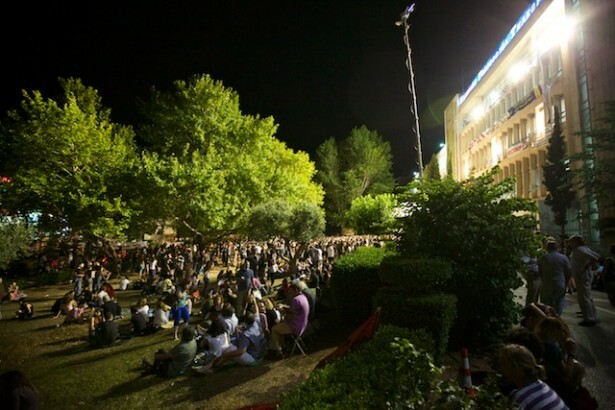 The occupation was a week-old when we first arrived at ERT’s Athens headquarters in Aghia Paraskevi. A flustered-looking receptionist checked our identification and issued us with “press accreditation” — flimsy pieces of paper with ERT’s logo printed on them, our names handwritten on and stuck to our clothes with paper clips. We were led through the gantry, up to the second floor and through the functional old-fashioned corridors to the foreign news department where stressed-out journalists were slumped over desks littered with crisp packets. That’s where we met Maria Kontaxi, the chief editor of the department. Maria started working at ERT 27 years ago, at the age of 18. Her entire career as a journalist had been built in this network. Now, with a simple government decree, it was gone. But just like all her other colleagues, she comes back to work day after day, playing her part in keeping ERT broadcasting 24/7. “This is more than a job. This is our home,” she told us. It’s a sentiment shared by everyone in the building. No one is getting paid, and no one knows if they will be re-employed under the government’s plans to relaunch the network as a leaner, semi-privatized outfit. Over 2,700 people lost their jobs when ERT was shut down, and the government has indicated that it wants the new public broadcaster to be about one-third its current size. Despite all this uncertainty, though, things are running as smoothly as possible. The janitors are coming back voluntarily to help tidy up workplaces. The hair and makeup artists are back in the studios to help the anchors get ready. The canteen in the heart of the building is conducting a brisk business. No one is getting paid, but no one is going home. They are not without their supporters. One afternoon a van pulls up in front of the building, and men begin to offload boxes and boxes of crisps and cheese sticks. 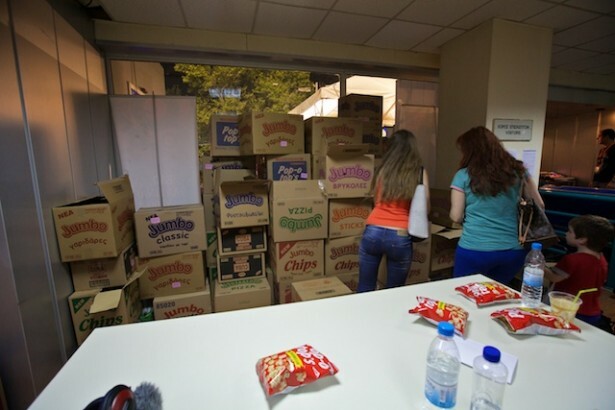 It’s a donation from a snack food company, their way of standing in solidarity with the occupiers. Just a cluttered corridor down from the foreign news department musicians wander outside the large music studios with their instruments in cases strapped to their backs. On top of its newsgathering operations ERT also has two orchestras — one a symphony orchestra playing classical music, another a more modern/folk orchestra — and a chorus. Together these musical ensembles form about 25 percent of Greece’s orchestras, but they too were disbanded with the shutdown of ERT. 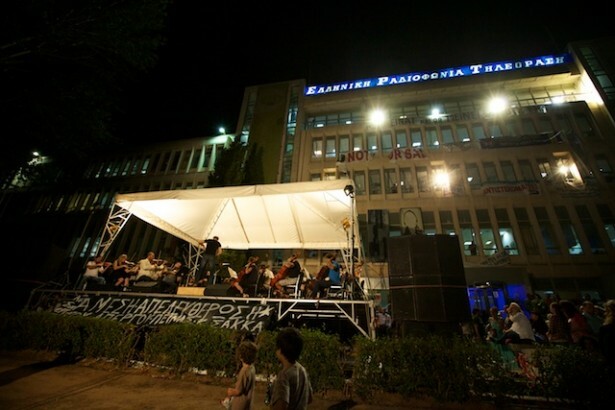 As part of the occupation, the musicians are also continuing with their work, attending rehearsals and performing every night on a stage erected outside the ERT building for their crowd of supporters. “We play music that we think people would like to hear. We play what we think will move them,” said principal cellist Vassilis Likos, who has been with the orchestra for two decades. It’s not difficult to tell that the insult of being referred to as a corrupt, wasteful organization has been very keenly felt within the walls of ERT. Although no one denies that there has been nepotism and favoritism, employees claim that it’s been part of Greek politics for a long time, and nothing to do with regular staff. In fact, the very spokesperson who had announced the shutdown had himself been an ERT employee in 1995, when his father had been a member of parliament. Greece’s coalition government has only been in power for about a year, but ERT’s closure has sparked off yet another political drama. After failing to reach an agreement over ERT, the Democratic Left chose to leave the coalition. While this has dealt a blow to the government, it has not dissolved it. The remaining two parties, New Democracy and PASOK, will continue the coalition after coming to a compromise: in line with the ruling from Greece’s State Council, ERT will resume broadcast as soon as possible with a staff of 2,000 (including the orchestras) until a new streamlined public broadcaster can be formed. The lack of clarity has led to unwillingness to end the occupation. The Finance Ministry has called for an evacuation of the building, so as to initiate procedures to give the staff their severance packages and resume broadcast with a smaller staff. ERT’s union rejected this call and the workers remained inside. It is a stand-off that could drag on. ERT’s employees certainly hope it does anyway; they’re not sure what else they can do. It’s tense within the offices and the studios. Rumors that the government could be sending the police to force them out of the building are rife. As a form of defense, ERT journalists are appealing to the Greek public to gather outside their building, creating a human barricade like they had done when the government first made its announcement on June 11. As the long weekend wears on rumors of a police raid continue to grow. Everyone thinks it’ll happen, but no one knows exactly when. But the concerts continue every night, and the journalists keep on with their live programming, refusing to let the network fade completely to black.